We also love pepper jack cheese as a topping. Season the pork chops with garlic salt and place in the crock pot. Pour the chicken broth into the crock pot. I make sure that their is enough broth to cover most of the meat. I set my crock pot to high for at least 6 hours. About 30-60 minutes before you want to eat, take the pork chops out of the crock pot and pull them apart with two forks. It should shred easily. Drain all the broth and contents out of the crock pot and put all the pulled pork back into the crock pot. 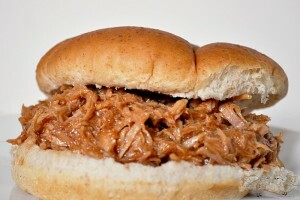 Pour as much BBQ sauce onto the pulled pork as you desire. Our favorite sauce is Sweet Baby Rays Sweet and Spicy - it has a great tang to it. Keep the crock pot on warm until you are ready to eat.